Get ready to be jamming for your next party! Invite your friends to a reggae-themed party. The theme can be a bit tricky, but if you put up some tropical or red, white & yellow decorations, bring out some traditional Caribbean foods, and lots of reggae music will complete the theme. The smooth, laid back vibe of reggae music complements most types of parties and gives people the feeling of the Caribbean Islands. 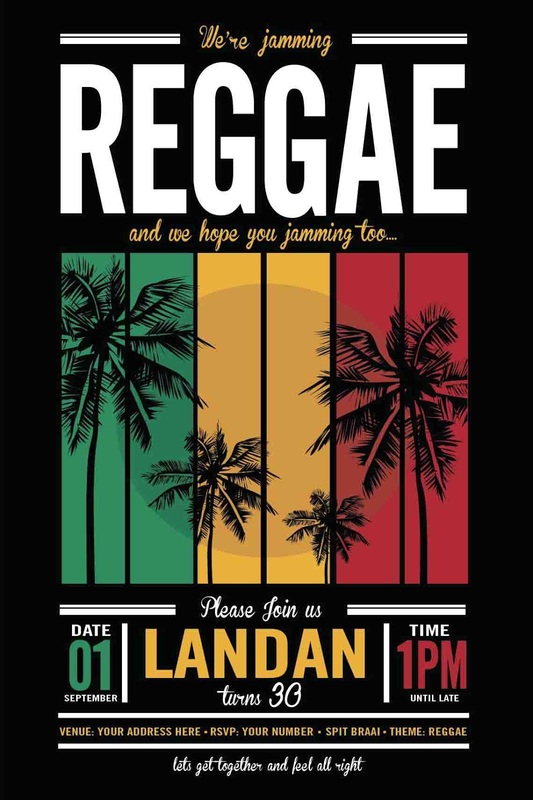 Why not start with your party planning with reggae theme invitations. Invite your guests to your Party with a personalised invitation! Customise with your party details and we will email you a high resolution jpg. Print as many as you need or simply use it as an e-vite to be emailed, whatsapped or smsed!